We modified this 8 round EUE coupling to accept a left-hand thread packer cup, and we welded it to a thimble. The threaded packer cup is like a regular packer cup except for the fact that it has an integrated threaded insert to allow for easy and quick connection to a tool or assembly. This makes these threaded packer cups easy and quick to connect to a tool or assembly. The threaded packer cup comes in a variety of materials and sizes in order to accommodate multiple well conditions. We can design steam cups facing any direction; up, down or opposing. 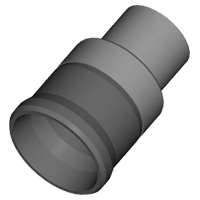 The threaded packer cup is typically used in low-pressure applications such as steaming or blocking off a water zone. A threaded packer cup is not typically used for high-pressure wash applications but the custom inserts and rubber compounds are perfect for a variety of applications. Quality Threaded Packer Cups from Global EEE! As with all Global Elastomeric Products, we guarantee this threaded packer steam cup is free from defect. Since 1963, we have been outfitting oilfields with standard and custom-designed solutions for well production and servicing. If you're looking for a customized steam cupproduct, let us know. We can create a rubber product for virtually any oilfield or agricultural application. For a free quote or to place your order for threaded packer cups, contact us today.